Suspended Deputy National head of Public Prosecutions Advocate, Nomgcobo Jiba, is expected to be cross-examined when the Mokgoro Enquiry resumes in Pretoria on Monday morning. Last week, Jiba denied receiving bribes from African Global Operations, formerly known as Bosasa. This after former Bosasa COO, Angelo Agrizzi told the Commission of Inquiry into State Capture Commission that the facilities and management company was paying high-ranking National Prosecuting Authority (NPA) officials Lawrence Mrwebi, Jackie Lephinka and Jiba monthly bribes to protect it from prosecution. Jiba and Mrwebi are being probed for their fitness to hold office following allegations of mishandling of high-profile corruption cases including that former Crime Intelligence boss, Richard Mdluli. Jiba testified that her salary only came from the NPA. 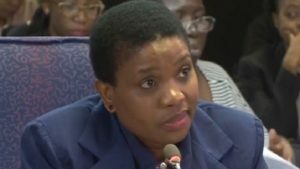 The post Jiba expected to be cross-examined in Mokgoro Enquiry appeared first on SABC News – Breaking news, special reports, world, business, sport coverage of all South African current events. Africa's news leader..